And less kick, powder, in a short action. Not to mention the 115 berger is about as good of a BC as possible currently in the .257. Thats middle of the pack in current .224 bullets. I love the .257 weatherby and it is certainly more versatile for other big game species, but I think this concept is extremely valid for our little Coues deer. Why has the ship sailed? Heavier bullets that don't get pushed around in the wind as much? Casey, the biggest why is because I have a model 7 action to build off of. As far as I know this concept is the best thing going in a short action/model 7. The end goal is a lightweight gun. 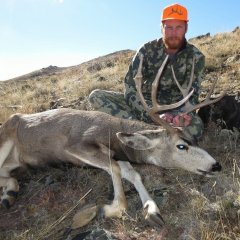 What experience is out there with FAST (3400+) .224 caliber heavy ish (70 to 80gr) bullet performance on Coues? I'm looking at building a 22 creedmoor, 22-250AI or 22-243AI twisted fast enough to run the heavier bullets. This would be a Coues only gun. The idea of a flat shooting, light recoiling, Lazer beam of a round intrigues the heck out of me. Speed kills in my experience. 108" ish. 105 frame and tine length with some kickers and a little extra mass. Awesome buck regardless of the score. Thanks I'll check that out. Anyone with a 65mm razor spotter interested in a deal? Price drop again. Someone make an offer or a trade for a 65mm spotter or a smaller 80mm spotter. Can meet at Bass pro or Sportsman's in Mesa. I really like the Viper HD 85mm. It's a bummer it doesn't fit in my pack pocket. The Opticron is also super nice and lightweight but I just don't have the need for a 50mm spotter. Price drop. Vortex down to $800, Opticron down to $375.